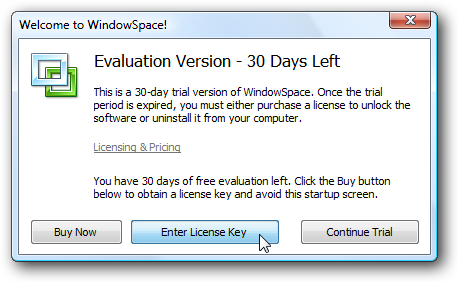 In order to unlock the full-featured version of WindowSpace, you must have a serial number provided by NTWind Software. The serial number can be purchased online at this website, go to the order page for more information. Once you have a serial number, you can proceed to the software registration. Follow the steps below to register your copy of WindowSpace. Click the "Enter License Key" button to proceed with the registration. 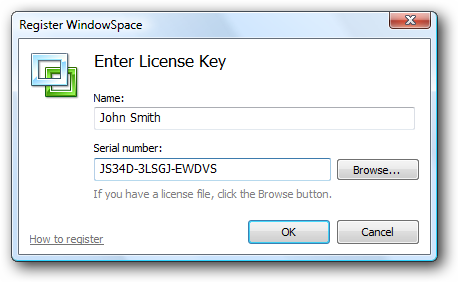 Enter your registration name and serial number into this dialog and click OK.
WindowSpace will prompt for administrative privileges in order to save the licensing information for all users in the system. 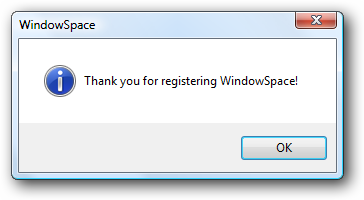 Click Cancel in the UAC confirmation dialog to register WindowSpace only for the current user. Now you can start working with a fully functional version of WindowSpace. To make it easier to deploy the software on multiple workstations, you can create the license file manually. The license file must be called wspace.key or wspace-key.txt and contain two lines of text with your registration name and serial number. You can save the license file in ANSI or Unicode. Though it is highly recommended to use Unicode if your registration name contain non-English characters (German umlauts, characters with diacritical marks, etc). You can use Notepad to save the license file in Unicode, select File -> Save As and choose the Unicode encoding. Save the license file to the same directory as the WindowSpace installer, run the installer and it’ll automatically register the software. Alternatively, you can put the license file into your WindowSpace installation directory and restart the program. If you have lost your product key, contact us. Remember to provide some information about you and your purchase (order#, email, name, company, approx date, etc).